The OPAM-1 case explores the ability to rapidly and robustly mesh parametric variations of a geometry model. A secondary goal is the rapid generation of geometry models. The intent is to simulate the application of CFD in a design environment. There are three ways to participate in Case 3 that differ only in the source of the geometry models. In all instances, you will mesh the geometry models and report the results. Use Committee Provided STEP Files: Mesh the STEP files provided by the committee for the five required configurations. Create Required Geometry Models: Use the parametric definition of OPAM-1 to generate your own geometry models for the required configurations. Create Optional Geometry Models: Use the parametric definition of OPAM-1 to generate your own geometry models for configurations of your choosing. The OPAM-1 configuration is a notional commercial transport aircraft. Its baseline configuration was created in the open-source, Engineering Sketch Pad (ESP) software. The aircraft is defined by 53 design parameters (for example, wing sweep, fuselage length, semi-span location of pod) from which a solid model consisting of spheres, cones, cylinders, and ruled surfaces is created. Case 3 includes the following required configurations that involve changes to major design parameters. STEP files of the geometry model will be provided for all required configurations. Case 3a: Baseline OPAM-1 configuration. Download STEP file. 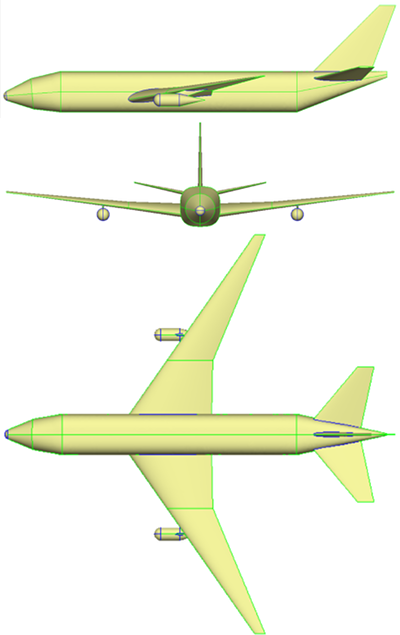 Case 3b: Shape variation, widen fuselage. Download STEP file. Case 3c: Shape variation, increase wing sweep. Download STEP file. Case 3d: Topology variation, move pylon to wing break 1. Download STEP file. Case 3e: Topology variation, narrow pod and shorten pylon. Download STEP file. If you must or prefer to use command line ftp, follow these instructions. More information on the OPAM-1 case including the design parameters used in its creation can be found in GMGW2_Case3.pdf. IMPORTANT: During the workshop an inconsistency was discovered in the design parameters (as described in the PDF above) and the STEP files. The STEP files remain unchanged but a revised description and a revised script for use in the ESP software were created. Participants will be asked to generate an Order 8.5 (aka Medium resolution, 316 million cell) mesh for each parametric variation of the geometry model. Specific guidelines are as follows. Document the process, resources used, timings, a priori metrics, and metric values during mesh generation. Report that data and more via the Participant Questionnaire (PQ). Download the PQ now and update it through your meshing process. Do not wait until your mesh is done to complete the PQ. If you generated your own geometry models, they need to be submitted for evaluation. You do NOT need to submit your mesh files. However, your presentation at the workshop should include information about any meshes you generated. The PQ also asks that you report a variety of mesh quality metrics. Once all files have finished transferring to the workshop FTP site, send an email to meshingworkshop@gmail.com.